So it’s been business as usual with good healthy eating and some exercise most days. Weekends still involve a bit of excess on both food and alcohol which always takes me back a step, so I lose in the week and put some back on the weekend, but as long as overall I’m moving in the right direction then I’m happy with that. My next big goal is to get in even better shape by the time of my next vacation on 30th March, which gives me eight weeks to make some progress. I’ve decided to step up the exercise as I’ve taken it pretty easy for the last year and am certainly fitter and leaner and probably ready to start ‘working it’ as they say. Again, I’m not going to force myself to do anything but I just feel ready to do it so why not? I’ve been researching different fitness programs and from what I’ve learned the real key to getting good results is something called Muscle Confusion. Apparently, if you do the same exercises all the time, your muscles adapt and become very efficient at doing them. That’s why they are so good at what they do. But this means that they require a lot more working to get the same gains as you would have got when you first started and often this is really difficult to do. So what you have to do is change the specific exercises you do on a fairly regular basis. This means your muscles don’t get a chance to adapt to the exercise and are being constantly forced to work hard. This in turn means burning more calories and, if the correct nutrition is taken, more muscle growth, which is something I’m keen on, being a bloke! So I’ll be having a go at some new things over the next few weeks and I’ll report on my progress as I go along. Eight weeks and counting, lets see what happens. Here’s an inspiring story of a young overweight lady that lost weight after getting cancer. And a great job she did too! AN 18-STONE woman was inspired by cancer to lose weight — and has dropped seven dress sizes. Emma Parker, 20, was overweight since she was eight. By the time she was 20, 5ft 2in Emma weighed more than 18st — making it hard to climb stairs or walk the dog. Emma was diagnosed with Hodgkin’s Lymphoma in August 2010, when she was 18. But when doctors told her she was beating the cancer, she saw it as a “second chance at life” and decided to lose weight. Emma, from Jacksdale, Notts, joined Slimming World — and in just seven months lost 8st, with even her doctor struggling to recognise her new look. She said: “Having Hodgkin’s lymphoma made me realise how important life is and not to take things like your health for granted. Emma, who will have been ‘all clear’ from cancer for a year next month, told how she had discovered a lump in her throat and been diagnosed with cancer. She said: “I’d been struggling with my breathing a lot and even started using an inhaler, then I got a cough that wouldn’t go away. Emma underwent 12 gruelling chemotherapy sessions and a biopsy and was delighted when doctors decided she didn’t need further treatment. She joined Slimming World with her doctor’s approval. At first she kept her cancer quiet, but as her confidence grew she began going to meetings without her wig and found she was fully supported by her group. She said: “I never tried any diets because I didn’t believe they’d work for me and I thought I’d always be big. “My auntie was going to Slimming World and every time I saw her she looked better and better. I was nervous because I thought I’d be the youngest person there and worried people would laugh or stare, but there were people of all ages and I got such a warm welcome I immediately felt more relaxed. “The results have been unbelievable too. I lost 4lb in my first week and that’s when I knew I could really do it, because I realised I could lose weight without feeling like I was missing out on the things I like. She regained her confidence, starting to go walking with her parents, swimming with friends and for bike rides with her boyfriend. By October 2011 — seven months after joining — she reached her target weight, dropping from to 9st 11lbs and from a size 22 to a size ten. Her group voted for her to represent them for the Miss Slinky competition and she has been named Slimming World’s Miss Slinky 2012 — taking home £2,000 which she plans to spend on a new size ten wardrobe. She said: “Every week my Slimming World Consultant Sue and the rest of the group would congratulate me on how well I was doing and it encouraged me to keep going. “At first no one knew that I’d had cancer, but the first time I was confident enough to turn up without my wig everyone was so amazing and supportive. “My doctor at the hospital has been really impressed with my weight loss too and he says he doesn’t recognise me anymore and I’m hoping to be able to celebrate being all-clear for a year in February. “Losing weight hasn’t just changed the way I look, it’s changed my whole outlook on life. “I’m so much happier now and I believe I can achieve anything I want to. Breakfast: usually nothing. If anything, a bowl of sugary cereal or toast with chocolate spread or peanut butter. Lunch: sandwich made with sandwich filler, packet of crisps and chocolate bar. At college would grab something from the cafe like chips and beans or pie and vegetables or go out for fast food or a pasty. Dinner: sausages, buttery mashed potato, Yorkshire puddings and gravy; chicken nuggets and chips; takeaway chip shop kebab or Chinese with chips. Snacks: chocolate bars, crisps, ice cream, biscuits, the occasional piece of fruit. Breakfast: poached egg and beans on wholemeal toast; Weetabix or porridge topped with chopped banana; or, if in a hurry, a high-fibre bar and a fat-free yogurt. Lunch: chicken pasta salad or jacket potato and beans, with a Mullerlight yogurt and fruit. Dinner: gammon steak topped with pineapple, peas and Slimming World chips; chilli con carne with rice; ham and egg linguine; or steak and Slimming World-style chips (baked in the oven) with grilled tomato and mushrooms. Snacks: fat-free yogurts, fresh fruit, a bag of Walkers French fries, a two-finger Kit Kat, carrot sticks, sugar free jelly, fruit kebabs, meringue nests topped with fresh fruit and fat-free yogurt. Here’s an interesting article from The Express today about ‘Gastric Band Hypnosis’ in which the subject is hypnotised into believing they’ve had a gastric band fitted and therefore feel full much quicker. Apparently it has an 80% success rate which is even better than the 70% claimed from the actual surgery… safer too! WE’RE halfway through January and for most of us the resolutions have slipped a gear and it looks like we won’t be delivering the slim, non-smoking, de-bugged Self 2.0 that we promised to launch. There is one way to get back on schedule: through hypnosis – the dark side. 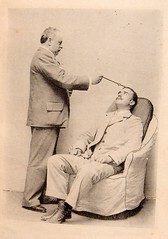 For at least a century hypnosis has been trying to bury the image of the swinging watch and waxed moustache. It has been promoted as a mere relaxation technique and has ended up in the same aisle as crystals and whale-music in the self-help supermarket. But a new gastric band hypnotherapy treatment that has helped hundreds of people to lose rucksacks of fat is likely to bring hypnosis back where it belongs and where it works best: as a dark art that bamboozles your mind into behaving itself by the power of suggestion. In gastric band hypnotherapy the obese patient is hypnotised and lied to. Through verbal suggestion and play-acting the Hypnosis patient is made to believe that they have undergone gastric band surgery. Their appetite is drastically reduced. Gary Barlow has been successfully treated for a fear of spiders. This has proper Svengali overtones, recalling George du Maurier’s 1894 novel Trilby in which the sinister hypnotist turns an ordinary woman into a theatrical star whom he can manipulate. The 80 per cent success rate of hypnotic treatment beats the 70 per cent success rate of real gastric band surgery comfortably. Yet the reputation of hypnosis remains rocky with mixed reports about its success. Gary Barlow has been successfully treated for a fear of spiders. Russell Grant used hypnosis to propel himself through Strictly Come Dancing on a bad hip and Joanna Lumley beat panic attacks with the help of hypnosis. On the other hand the England football squad was reported to have been hypnotised to believe they would be unbeatable in the 2002 World Cup and Kate Moss is supposed to have tried hypnosis to give up smoking. Hypnosis can do good but it can’t do miracles. I know hypnosis works because I learned how to hypnotise people from a doctor who worked at a psychiatric hospital and had treated several of my highly strung friends. As his private student I was allowed under supervision to lead several volunteers into a trance. I could talk consenting friends into falling backwards helplessly without them even knowing that they would be caught. Experimenting on myself I found it easy to dismiss sensations of cold by suggestion so that I was able to walk around in shirt sleeves in winter as if I were a Geordie. When I went shopping for hypnotherapy years later I was disappointed to find that most hypnotherapists aren’t very interested in the power of suggestion. They want to sell you 10 weeks of talking sessions in which you are supposed to unearth rotten old thoughts and memories such as that terrible day when your dad spanked you with a butter pat while dressed as a clown. It can help some people but it won’t get you over that crippling phobia of clowns nearly as well as old-school hypnosis, in which a charismatic and authoritarian hypnotist puts you under and tells you you’re fine about clowns. I discovered several distinct species of hypnotherapist: there is the Gadget Boy Hypnotherapist who sits you on a hydraulically reclining Mastermind chair, puts you in headphones and hypnotises you through a microphone with a slight reverb. There is the Nursey Hypnotherapist, a deceptively nurturing older lady, probably an ex-NHS psychiatric worker. Then there is the Hippie Hypnotherapist, likely to try to steer you towards crystals, spirits and energies. I even encountered a holistic healer who offered a package deal of hypnotherapy with colonic irrigation. I told her what she could do with her irrigation. For the rich there are celebrity hypnotherapists such as Paul McKenna. Even if I could afford him I’d wonder. Despite writing a book called I Can Make You Happy, at times he strikes me as being unhappy and unfulfilled as only a man who owns several Ferraris can be. The important thing is to find a hypnotherapist willing to cut down on past-life chit-chat and help you tackle irrational fears and filthy habits. It’s a good sign if they offer hypnotic gastric band therapy. It’s probably a bad sign if a hypnotherapist offers too many fringe therapies. One practice sells a £12.99 hypnosis CD for non-surgical breast enlargement. Hypnotic breast-enlargement is controversial, although thinking yourself buxom looks like a better bet than silicone right now. Another practice offers “past life regression” therapy in which clients are encouraged to remember traumas from past lives. I don’t believe in it, though I have witnessed “class regression” in which a hypnotised subject dropped his mockney accent and spoke the received pronunciation that his parents had taught him. It’s tough to find a hypnotherapist who will really hypnotise you but it’s worthwhile when you do. I’ve said right from the beginning that Weight Loss pills and potions, including supposedly ‘natural’ remedies, are a waste of time, a waste of money and potentially damaging to your health. You just don’t need them at all. Well, here’s a great article from Health Canada, that talks about not only the potential toxic effects of this stuff on your own health, but also on the environment. Are weight loss herbs environmentally safe? Faster than you can say “Jenny Craig’s a millionaire,” the feasting season is behind us and weight loss resolutions are in full swing. Gyms are bursting at the seams, ab rollers are flying off shelves and, yes, so are slimming supplements. So, are they good for you or the planet? You may be tempted by all the “natural” products on shelves claiming they can help melt away the pounds, but far too many have proved dodgy in some way or another. Health Canada actually recalled 68 specific brands of so-called natural or herbal weight loss supplements in 2009 because they contained undeclared prescription-only ingredients (including phenolphthalein, now off the market because of cancer concerns, and phenytoin, whose side effects include speech and vision problems). But what about all those other slim-quick supplements still on shelves? Many are dogged by sustainability headaches, while others raise concerns about contamination. In 2010, ConsumerLab.com found that a couple of herbal weight loss formulas (Mega-T Green Tea and Dexatrim Max) were tainted with cancer-causing hexavalent chromium (the pollutant made famous by Erin Brockovich). 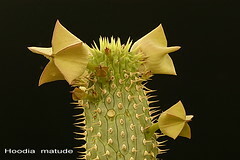 Probably one of the biggest environmental fiascos of the dieting world is hoodia. When 60 Minutes dedicated airtime to the potentially amazing appetite-suppressing power of an African cactus called Hoodia gordonii, sales went through the roof. Fabulous and all, except that the Kalahari only has so much hoodia, much of it heavily stressed. Though it’s a protected plant in most of South Africa, Botswana and Namibia, illegal harvesting is a massive problem. Environment Canada says illegal shipments of the diet pill are intercepted daily at mail centres, courier offices and airports in every major Canadian city. During the summer of 2006 alone, 2,000 shipments were stopped. Environment Canada warns you to buy only from a company that can show you the proper CITES (Convention on the International Trade in Endangered Species of Wild Fauna and Flora) permits – but come on, just leave the poor hoodia plant alone. Even Unilever walked away from developing a hoodia product when trials found it raised blood pressure and had little impact on calorie consumption. Forskolin is a rising diet supplement made from the root of the Indian plant Coleus forskohlii, which is endangered in India. The United Nations Food and Agriculture Organization says efforts to cultivate C. forskohlii for medicinal use will protect the plant. But even though cultivation is expanding, supply is still limited, so prices are high. To make sure you’re not buying wild-sourced forskolin, look for certified organic, which guarantees it wasn’t plucked from the wild willy-nilly. If you want a sustainable weight loss supplement, you’re better off swallowing trendy konjac root before your meals. (The root, which looks like a yam, is grown in India, China, Korea and Japan). Konjac’s glucomannan fibre bulks up in your stomach and keeps you feeling full longer (plus, it’s a cholesterol lowerer). Highly touted PGX contains the stuff, although really, high intake of any dietary fibre will help do the same thing. Try psyllium husks that are certified organic for a better price. Another promising compound without environmental concerns is fucoxanthin, or brown seaweed extract. Green coffee extract is in the clear if you get it organically sourced. Glucose-metabolizing chromium polynicotinate is pretty environmentally neutral. Vegan alert: most CLA (conjugated linoleic acid) supplements are made from beef extract, but vegetarian versions are available. Of course, you’ll want to run any weight loss supplement plans by your health provider, and I’m not vouching for the efficacy of any of the above. What I can promise is that no weight loss pills will live up to your slim-fast dreams. If you really want to lose a few pounds and save the planet at the same time, eat less carbon-heavy red meat and dairy, fill up on lots of fibre-rich organic veggies and legumes, unplug from your computer/gaming machine/TV more often and get moving. Walking, cycling, running and old-fashioned yoga (not the “38°C in winter” kind) are all optimal ways to slim down and shed a few pounds of carbon, too.